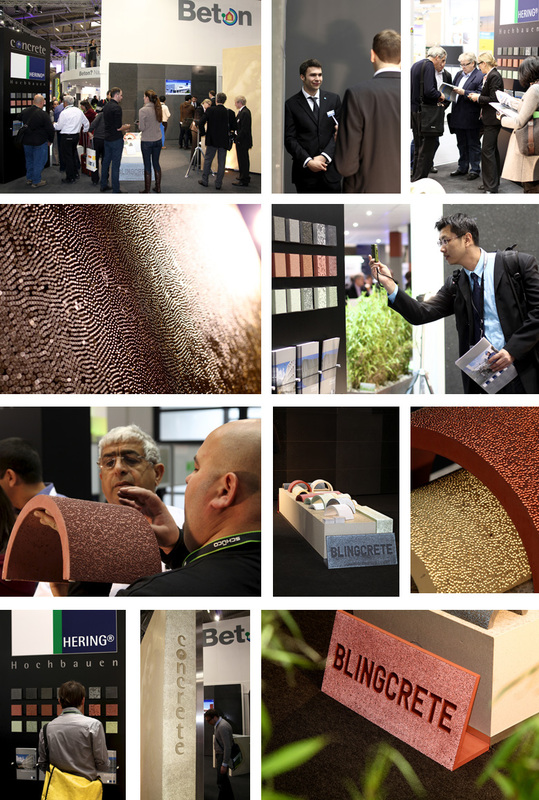 BlingCrete™ at BAU 2013 – The World’s Leading Trade Fair for Architecture, Materials, Systems | BlingCrete . BlingCrete™ will be exhibiting at BAU 2013. The World’s Leading Trade Fair for Architecture, Materials, Systems takes place from January 14 to 19, 2013 at Messe München exhibition center. Once again the event is expected to attract around 2,000 exhibitors from more than 40 countries and approximately 240,000 visitors from all over the world. You find us in Hall A2, Stand 328B, at the joint stand of Beton Marketing Deutschland and Hering Bau GmbH & Co KG. There will be a lecture about BlingCrete™ by Thorsten Klooster and Heike Klussmann as part of the congress “High-Tech Materials in Construction Industry”. This congress presented by the German Federal Ministery of Economics and Technology BMWi, the Federal Ministery of Education and Research, the German Centre for Innovation RKW and the VDI Technologiezentrum examines strategies in high-tech for the construction industry. The event takes place on January 15. at 3.45 pm at the ICM Munich Forum. The participation in the conference is free and can be reserved online. For further information please have a look at the RKW project website (German language only). Annette Hering (Managing Director Hering Bau GmbH & Co. KG) will participate in the debate on “The Future of the German Construction Industry” within the conference „Deutschland baut! Jeder kämpft für sich alleine“. The panel discussion will be moderated by n-tv-Founder Karl-Ulrich Kuhlo. The event takes place on January 14, 11 – 11.45 in Hall B0. We will be happy to welcome you at BAU 2013!